Florsheim shoes and bow ties, staffriders are something of folklore on the streets of Soweto. Staffriding, otherwise known as train-surfing, began when trains first started ferrying commuters from Soweto to Jozi. More than just a means of showing off, staffriding became a way to outrun the cops after a secret meeting or to avoid being caught without a dompas. Both activists and criminals surfed the tracks as they sought a fast means of escape. Fast forwards fifty years and the culture is alive and well, and just as deadly. Generations of young, rebellious teenagers have made the pastime their own, and train-surfing has taken an all together different and more dangerous direction from its early days as a way to stick it to the state. Directed by Sara Blecher (known for producing local TV shows like Zero Tolerance and Bay of Plenty among many others) Surfing Soweto takes us deep into this surprising, Youtube-friendly phenomenon. Developed over three years, the film follows Prince, Lefa and Mzembe. They are Soweto’s ultimate badasses. We see how train surfing quickly morphs from an after school lark for the trio to a burgeoning cult thing they are both proud of and freaked out by. 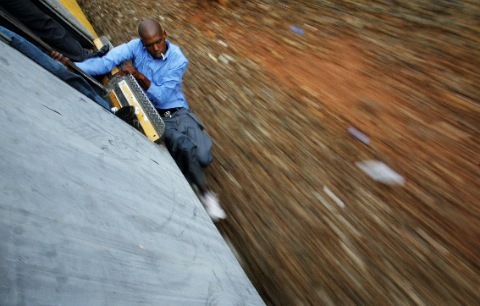 Prince is The Godfather of train surfing in the township – schooling guys on the dangers. He’s a self-declared platinum medalist of the ‘sport’. This is a community that has changed so much since the Soweto Uprising and now has a new form of youth rebellion, more nihilistic and doomed, that chimes with the blunted Zuma era. “I wanted to show what’s going on with the youth of Soweto thirty years after that famous uprising. That change is what inspired me,” Blecher says. Train-surfing is a death-game played out by a series of counter-culture anti-heroes trapped in a hopeless situation. No jobs. No future. It’s a punk reaction to being caught without prospects in the rising post-apartheid consumer culture. But Surfing Soweto is not chiefly a political film. It’s more a humanist tale exploring the conditions that drive these kids to casually risk their lives for fun and fame. We stay with Mzembe as he tries to find his roots, and follow Prince and Lefa as they try to get an education. There are stupendous, edge-of-chair train-surfing montages and vivid real-time interludes of drugs and crime. One of Blecher’s biggest concerns making the film wasn’t whether her subject would be open to the process, but how to develop their trust. The answer was to get the train-surfers to document their own experiences. Turning the camera on their own lives, giving this pungent film a rare immediacy. Surfing Soweto is doing the international festival circuit and has already won the Tri-Continental Human Rights prize. Simply getting the film out there has been a victory for both Blecher and the surfers. Sadly, Surfing Soweto is not yet scheduled for wide release. To those that have seen it please share how…Id love to see it. @LizzyWhats DIFF? so how do we get to see it? Got a contact with a DVD store…who can we buy it from? this is bad! yes, i understand its an activity done by our heros back in the day, but now what is it worth? nothing! do not excite these kids to kill themselves!! A fine write up about a terrific documentary. Surfing Soweto screened in London (London, England that is) last night as part of Film Africa. I was captivated by how a tragic story was told in such a beautifully poetic way. Fingers crossed it reaches a wide audience in South Africa and beyond. The artistry and horrors of the boys’ lives needs to be seen. Thanks Sihle, this is a great review.